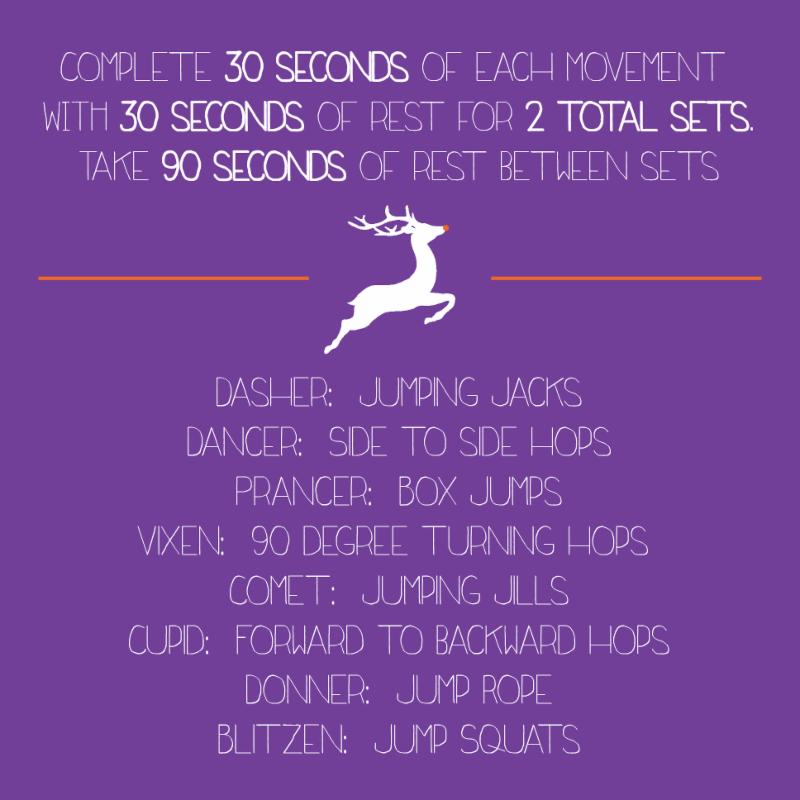 Every year my Personal Training clients get to experience different forms of holiday inspired workouts, so join in with us for Santa’s Eight Tiny Reindeer Plyometric Workout! Plyometrics are jumping exercises. They increase your metabolism, strengthen your cardiovascular system, boost the number of calories you burn and stimulate your neurological system more than repetitive cardio activities like stationary biking, rowing or walking. They are a great bonus to throw into your workouts but progress slowly even if you are well conditioned as they are a unique challenge to your body. You can quickly overdue it or injure yourself if you do plyos for too long of a period of time. Start with 30 seconds (as in the workout below) and work your way up to longer periods of time (45-60 seconds) over the course of a several weeks as you allow your body to recover from each work out properly. Are jumping movements too tough on your joints? Then opt to do them on a rebounder (mini trampoline). If that’s not an option, follow the program below using a cardio machine such as a treadmill, bike or elliptical for the allotted amount of time of exercise to rest intervals. If you are just beginning your fitness program give yourself longer periods of rest and work to decrease your rest period over the course of several weeks. Don’t be a cotton headed ninny muggins and try to kill yourself with intensities you could do easily 10-20 years ago when you were super fit. Be kind to your body and in return your body will love you for it. Trust me, if you are consistent in your efforts and follow the right guidance you’ll be killin’ it in no time my Plyometric Princes and Princesses! And, if you can still name all of Santa’s Eight Tiny Reindeer at the end of the workout, then you definitely get labeled as a well-conditioned Rudolph! Santa will be proud.